Purchase an activation code and unlock a wealth of extra features, including autocompletion, code snippets, cross-database querying, NuGet integration, direct editing of SQL data, and a fully integrated debugger! No further downloads are required. Be up and running in less than a minute. All licenses are perpetual (non-expiring) with free minor updates. *Price reduction valid this month. 30-day unconditional refund guarantee on all purchases. Member lists & completion, with list filtering and "camel humps"
Autocompletion works not only with LINQ queries, but with the entire C#/F#/VB language. LINQPad’s unique Power-Tick lets you select multiple properties, when creating anonymous types in C# or VB, without closing the popup. This is a massive time-saver. When you enter an unresolved type, LINQPad instantly scans the .NET framework and offers a smart tag to add the namespace and assembly reference. And you don’t even have to get the casing correct! So, if you type protecteddata, LINQPad’s smart tag will import the System.Security.Crytopgraphy namespace, add a reference to System.Security.dll, and correct the case. The Developer and Premium editions also enable your favorite Visual Studio C#/VB code snippets, plus a dozen unique high-productivity LINQ snippets - as well as any custom snippets that you define. 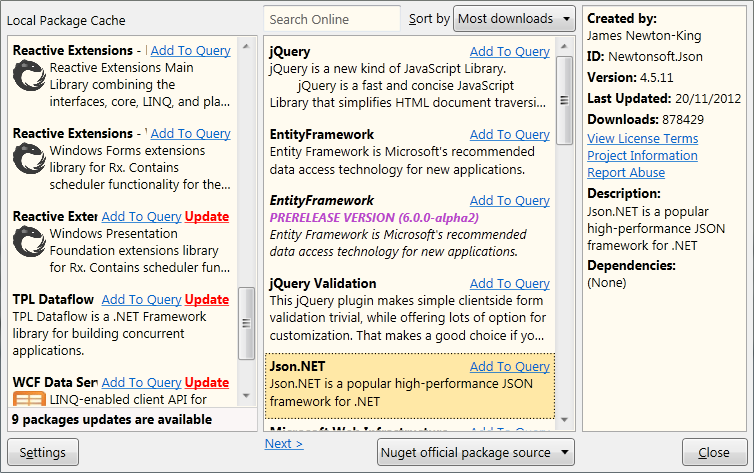 The Developer/Premium editions also unlock NuGet integration, so you can effortlessly reference anything in the entire NuGet library, and the ability to write cross-database queries - just control+drag additional databases from the Schema Explorer onto your query! 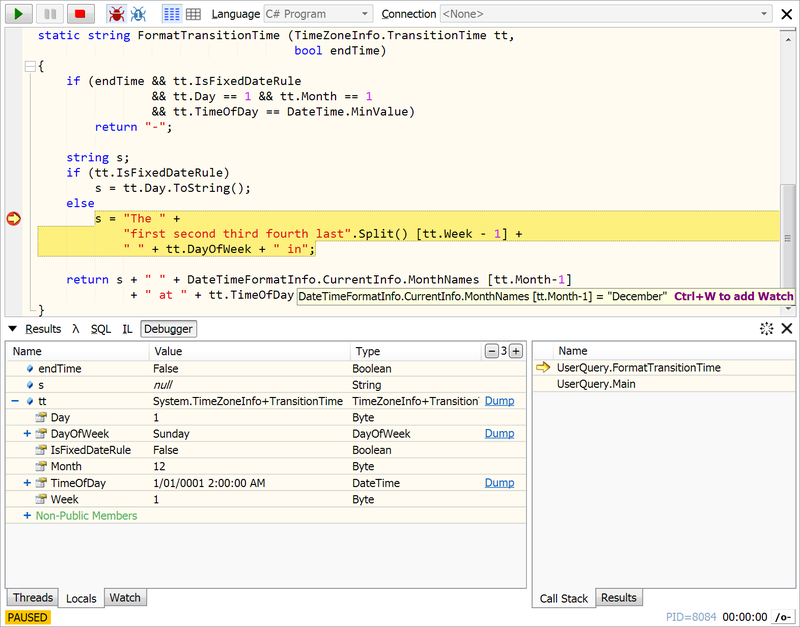 And these editions also let you open SQL tables for editing, saving changes back to the database. And with a premium license, unlock an integrated lightweight debugger. Single-step through your scripts, set breakpoints, and examine local variables! The debugger works with all CLR languages: C#, VB and F#. 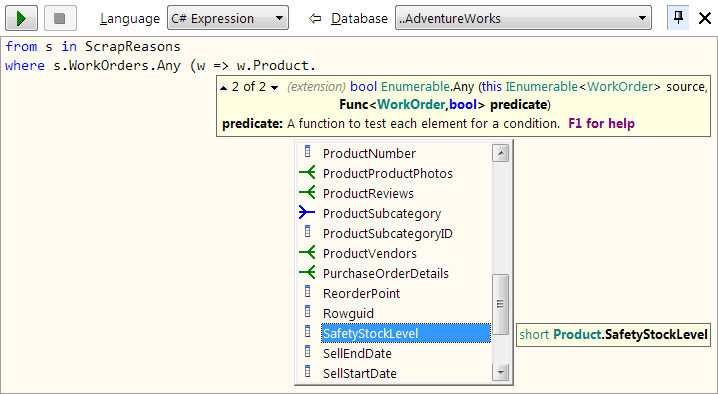 The premium license also enables advanced code fixes, including override method and implement interface/abstract class. We know that you’ll want to use LINQPad on your work machine, home machine and laptop, so we’ve allowed a single-user license to activate up to three machines at once for your personal use. You also get an additional three activations for virtual machines running VMWare, MS Virtual PC, Hyper-V, Azure Roles, or Azure VMs. And when they’re all used, you can transfer your activations - up to 6 times a year - through an automated web app. No extra downloads are required: just click Upgrade to Paid Edition on LINQPad's help menu, and enter your activation code. More than 20,000 customers use a paid edition of LINQPad, including 30 Fortune 100 companies and four of the world’s largest banks. The biggest corporate user is Microsoft, who have also been instrumental in helping with the product. The free edition has been downloaded more than one million times.